Could An American Ally Lose Its Democracy This Weekend? Turks denied their increasingly autocratic regime the ability to rule by decree earlier this Summer. 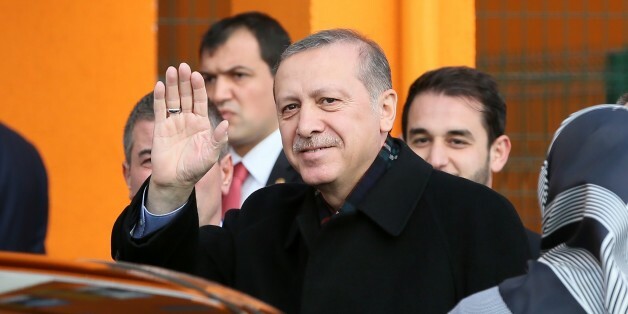 But a do-over election, following a brutal anti-Kurd and anti-opposition media campaign, shows that President Erdogan and his allies will stop at nothing to win, even if it means killing democracy along with Turks and Kurds who cross the majority party. And America's media is surprisingly asleep at the switch in informing us about such events. Turkey, a long-standing reliable NATO ally, has been a historic American friend, with the relationship dating back to the Jefferson Administration (when the country was the Ottoman Empire). When it came to the Korean War, the Cold War, and the first Persian Gulf War, you could count on Turkey to play a key role in helping out. That changed when Tayyip Recep Erdogan came to power as Prime Minister. Sure there was some optimism when the former Istanbul Mayor came into office, the perfect balance between Turkish democracy and Islam. But Erdogan has little respect for either ideology, using both for his personal advantage. When it came to foreign policy help, Erdogan was similarly AWOL. His opposition to the second Iraq War undermined America's plans, leading to a messier outcome. He ended his country's traditional respect for Jewish people with an anti-Israeli policy, leading to a bloody attempt to run the Gaza blockade designed to stop Hamas, a terrorist organization. 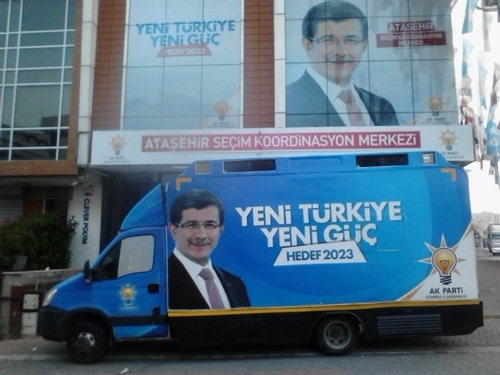 In the meantime, Erdogan sought to make his political party, the AKP, a tyranny by the majority. Former Islamic allies, the Gulenists (led by exiled cleric Fethullah Gulen, currently living in Pennsylvania) were jailed for uncovering corruption by Erdogan and his family. What he's done with palaces in his country is evidence enough for anyone of where the country's fortune has gone. 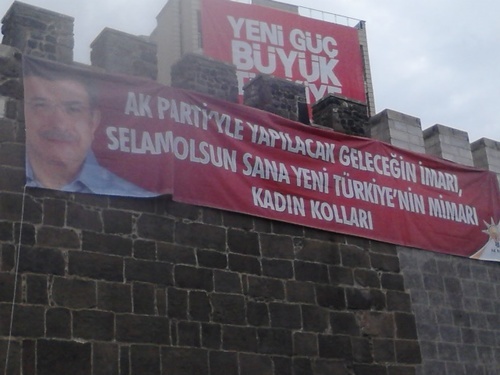 Even historic locations like this wall in Kayseri are covered by pro-government AKP posters. Photo was taken by the author. Going into the May 2015 election, Erdogan, who switched from Prime Minister to President, sought to remake the country's political system to give himself extraordinary powers not even available to American or French Presidents, but closer to a Vladimir Putin or even a Saddam Hussein. But a miracle happened. Secular social democrats (CHP), concerned Turkish nationalists (MHP) and Kurds (HDP) teamed up to deny Erdogan and his AKP the majority they desired to undermine the country's constitution, and even its democracy. Erdogan, however, refused to even let the opposition form a coalition. Instead, he demanded new elections for November 1. That wasn't enough for Erdogan, who shifted from peace talks with the Kurds to picking a fight with the PKK and blaming the HDP. Any Turkish journalist, or even kids as young as 12, who criticized Erdogan were jailed. Erdogan bombed anti-ISIS fighters in Syria. Then, bombs went off at anti-Erdogan rallies, killing hundreds of Turks and Kurds dead. Amazingly, most world journalists bought the government story that the PKK or maybe ISIS were responsible, and didn't bother to ask questions for themselves about who might really want anti-Erdogan protesters dead. They believe whatever Erdogan says about Gulen being a coup leader. Woodward and Bernstein wouldn't need so many hints to at least launch an investigation. You'd think the traditional American media to catch on to what's going on in one of the most pivotal American allies. But NPR called any idea that the government bore responsibility for the bombings a "conspiracy theory." And USA Today focused on attacking Gulenists and politicians who traveled to Turkey, instead of the arrest of anyone who spoke ill of Erdogan. These news organizations will believe anything the Turkish government tells them. The most you'll get is mild dismay, instead of real investigations and exposes. But not everyone will stay silent. Turks and Kurds who live there are doing everything they can to get the truth out about what's happening in their country. Some U.S. journalists are picking up these stories. Hopefully, the American people will learn what's going on, and demand some answers of the Obama Administration, for allowing Turkey to use NATO bases to target ISIS enemies, and of the U.S. press, to see what their agenda is concerning Erdogan.